The Beta RAM model-5 coupled with the industry standard Laura software, leads the way for radiochromatographers. Equipped with low dead volume fittings, tubing and mixing components the detectorsupports the latest LC techniques such as UHPLC, Fast LC, Rapid resolution LC and provides superb sensitivity with the speed and efficiency of on-line counting for Beta emitters. The Beta RAM range offers the versatility of either homogeneous counting by admixing with liquid scintillator via the accurate built-in pump or heterogeneous counting with a range of pre-packed solid scintillator flow cells. 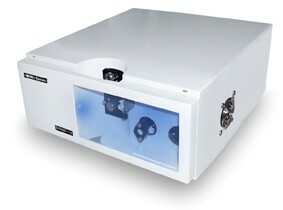 This makes the Beta RAM the versatile choice whether you are doing the most sensitive low level metabolism work or high activity preperative HPLC work.The revolutionary ‘’Active Counting Mode’’ (ACM) enables one to alter the detection characteristics according to a simple heterodyne model thereby allowing system to achieve unrivalled limits of detection. The Beta RAM also supports ‘’Stopped Flow Option’’ that replaces the requirement for time consuming and expensive Liquid Scintillation Counting of low level samples. Laura™, has been the recognised industry standard software for radiochromatography for over 25 years. It features single point control of the world's leading HPLC and radio detector systems to provide a single point of control for the entire radiochromatography analysis. Laura is fully compliant GLP and 21 CFR Part 11 compliance options .